This companion module, also known as the Invoice and Procurement Tracking Module, enables the user to collect invoices associated with a specific project. Upon the completion of the project, the user can consolidate all or selected invoices into one or more asset records in The Bassets Fixed Asset System. This consolidation feature provides for up to a 12 level hierarchy or consolidation tree to consolidate invoices that match a specific selection criteria into an asset record. The consolidation feature provides a complete audit trail and consolidation undo feature. Those companies that build their own assets, such as stores in the retail industry or tools and machinery in the manufacturing sector use this module. Other companies will use the Invoice and Procurement tracking module to allocate the expense of an internal project, such as a computer application, over a period of time between multiple departments or other entities within the organization. • An improved Audit Trail at the asset record level with the addition of a CIP Tab that lists all of the invoices consolidated to create the asset. The user would be able to view detailed information about a particular invoice with a simple mouse click. 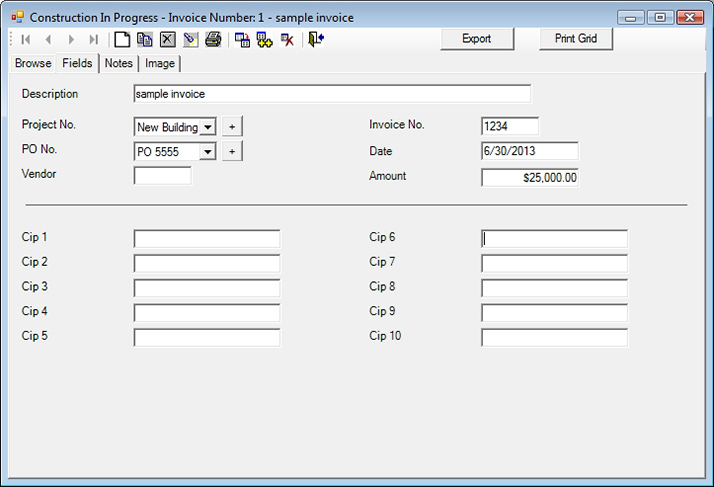 • Image capability has been added to CIP to catalog and view invoices and other documents relating to a particular invoice record. • Improved invoice consolidation with an added unconsolidate function. • Budget to actual by project.